The 1980s were the heyday of daytime game shows, and CBS’ Press Your Luck was a proto-game, ahead of its time—even being compared to the Titanic. From 1983 to 1986 (758 episodes), Peter Tomarken hosted the show, which featured three contestants who earned spins if they answered trivia questions correctly. If they did, they got to play the Big Board, which shuffled cash, trips, cars, jewelry, and other fine commodities. But if a contestant landed on a Whammy, the animated cartoon character appeared on screen and erased all of their money. At the time, Press Your Luck offered its contestants more cash than other game shows. In celebration of the 30th anniversary of its final original episode, here are 11 facts about one of the most exciting game shows of all time—no Whammies! 1. PRESS YOUR LUCK IS BASED ON A 1970S GAME SHOW CALLED SECOND CHANCE. Bill Carruthers produced the show Second Chance, which ran from March to July of 1977. Hosted by Jim Peck, it aired on ABC, not CBS. The show was a precursor to Press Your Luck in that it had a board with monetary values and prizes, a devil-like mascot, and three contestants answering trivia questions. But the board wasn’t technologically advanced, and during the taping of the pilot episode, $5000 was the highest amount a contestant could win. After airing for 95 episodes, the show was canceled, but Carruthers found a way to retool the show into the more successful Press Your Luck. 2. THE BIG BOARD WAS MADE UP OF SLIDES. PressYourLuck.com explained that in order to get the dollar values to change, each square contained three different slides. With 18 squares total, that tallies 54 slides. “However, on the pilot episode, there were more than three slides because on some of the squares, there was more than one Whammy,” explains the article. “The reason slides were used was because when they changed, it had a morphing look.” The slides weren’t as big as they looked on TV—they were the size of a typical photo slide. 3. BETTER OFF DEAD WRITER-DIRECTOR SAVAGE STEVE HOLLAND ANIMATED THE WHAMMIES. One of the best parts of watching Press Your Luck was seeing what kind of Whammy would appear when a contestant lost his or her loot. This website chronicles 79 different Whammies used on the show, including a Whammy on a flying carpet and a Whammy dressed as Ben Franklin. Before he became a filmmaker, Better Off Dead creator Savage Steve Holland dabbled in animation, and he’s the one who drew the aforementioned Whammies. “I was asked by the producer Bill Carruthers to invent a bad creature that stole people’s money,” Holland told Collider. “I drew something on a napkin and the producer said, ‘That’s it!’ He did the voice, not me. I animated that little fella on the most primitive computer animation system on Earth. It was steam-powered. But I love my terribly animated Whammies!" 4. A CONTESTANT CAUSED ONE OF THE BIGGEST SCANDALS IN GAME SHOW HISTORY. During the June 8 and June 11, 1984 episodes, a contestant named Michael Larson cheated the Press Your Luck system. He won $110,237 in cash and prizes, which remains one of the largest payouts from any game show. According to the 2003 Game Show Network (GSN) documentary Big Bucks: The Press Your Luck Scandal, the unemployed ice cream truck driver from Ohio spent months studying the light patterns of the Big Board and discovered a couple of squares always offered extra spins and no Whammies (he needed the bonus spins to continue his massive quest). On the first spin of the first round, Larson did hit a Whammy, but he recovered. He ended up taking 46 Whammy-free spins, racking up a lot of dough and alarming producers. The documentary also revealed how Larson would celebrate victory as soon as he hit the button, before the value sign was revealed. Though the producers knew Larson had participated in foul play, they allowed him to keep his winnings. With those 47 spins, the episode became so long it had to be split into two episodes. 5. A WHAMMY ONCE STOLE $31,408 FROM A CONTESTANT. Press Your Luck once had a winning cap of $25,000, but sometimes contestants—including Michael Larson—topped that. During the August 10, 1984 show, contestants Lori and Cathy spent several minutes passing each other spins—Lori passed to Cathy, she took her turns; she passed the remaining ones to Lori, Lori used them and passed them back to Cathy; and so on and so forth. 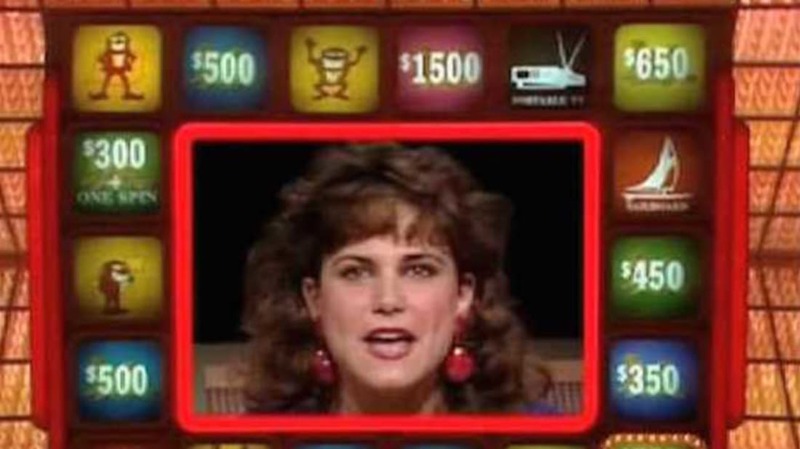 At one point it got so intense that Peter Tomarken joked, “Somebody alert Cedars-Sinai [Hospital].” Both of them kept winning, almost $50,000 between them, until Cathy finally hit a Whammy and lost her entire accumulation of $31,408. The third contestant, Randy, ended up Whamming out, thus Lori became the big winner with $24,685. 6. TWICE, ALL THREE CONTESTANTS ENDED THE SHOW WITH NO MONEY. The first time this happened was on November 26, 1984. Contestant Diane and returning champ Chris Whammied out, and Chris passed one spin to Dom, who had no choice but to take it. If he hadn’t hit a Whammy he would’ve gone home with $13,250. But since he lost, everybody returned the next day. Chris proved to be victorious and won the next three shows. The next time this happened wasn’t until a year and half later. The February 4, 1986 episode concluded with a three-way tie, but the contestants ended up with $0. Contestant Wayne hit a Whammy and lost $15,898. Dorothy took the lead with $10,366, and passed four spins to Joe. He lost his $6347 and passed two spins to Dorothy. If she didn’t hit a Whammy, she’d win; if she did, all three of them would get to come back the next day. As she said “No Whammies” in the split screen, Joe mouthed “Whammy,” hoping she would lose, which is exactly what happened. She was upset about her loss, but Joe and Wayne excitedly high-fived each other, as they knew they’d be back. For the first time in Press Your Luck history, all three players came back the next day (where Wayne won). 7. WINNING CONTESTANT MAGGIE SCHPAK DESIGNED JEWELRY FOR MOVIES. Maggie Schpak appeared on the March 9 and March 12, 1984 episodes, and an unaired pilot from 1983. In the pilot she goes by the name Maggie Brown, but on the other shows she’s Schpak. In her first aired appearance, she said she was the owner of “a metal shop in Hollywood. We make anything for space movies.” According to a DVD commentary for Star Trek III: The Search for Spock, she designed the Vulcan jewelry, and according to another article, she designed Anne Hathaway and Julie Andrews’ tiaras for The Princess Diaries. Schpak’s wild hair made her stand out to contestant Michael McSweeney, who proclaimed, “Everything about her was weird … Her hair looked like a rat’s nest.” Still, Schpak managed to beat McSweeney and become the champ with $12,932. 8. THE SHOW WAS BRIEFLY REVIVED AND REBRANDED IN 2002. Coming back as Whammy! The All-New Press Your Luck, former E! Network correspondent Todd Newton took over hosting duties, and the graphics of the board and Whammies changed drastically from the 1980s, from drawn Whammies to 3-D generated Whammies (the former looked better than the latter). Tomarken was actually considered for host—two pilots were taped in 2002, one with Tomarken and one with Newton—but producers opted to go with a fresh face for the new series. Whammy!, which wasn’t a huge hit like its predecessor, aired on the Game Show Network from April 2002 to December 2003. 9. PETER TOMARKEN DIED IN A PLANE CRASH IN 2006. On March 13, 2006, Tomarken was piloting his plane, a Bonanza A36, from Santa Monica to San Diego with his wife, when engine trouble caused it to crash into the Santa Monica Bay. The couple was volunteering for the charity Angel Flight West, which offered free flights for needy patients; the Tomarkens were on their way to San Diego to transport an ill patient to UCLA Medical Center. 10. FUTURE TALK SHOW HOST JENNY JONES APPEARED ON THREE EPISODES. Before The Jenny Jones Show debuted in 1991, Jenny Jones was a game show contestant on Press Your Luck, The Price Is Right, and Match Game. On the January 28, 1985 episode of Press Your Luck, she told Tomarken she had just moved from Canada and become a U.S. citizen. (Notice her name tag is spelled “Jennie,” not “Jenny.”) She won the episode, taking home $10,622, only because the leader hit a Whammy. She won $8084 in the next episode (January 29, 1985), but lost the third time around. 11. BILL MURRAY ALMOST PLAYED MICHAEL LARSON IN A MOVIE. In 2000 it was reported that Bill Murray would play Michael Larson in a film based on the infamous contestant. Howard Franklin, who worked with Murray on The Man Who Knew Too Little and Quick Change, was tapped to write and direct the movie, and Nicolas Cage was going to produce. Oddly enough, Murray was a trivia question on one of Jenny Jones' episodes.